English online business news service The Investor (www.theinvestor.co.kr) kicked off on June 14 with the aim of providing global investors with timely, accurate and influential information on Korea’s dynamic business landscape. 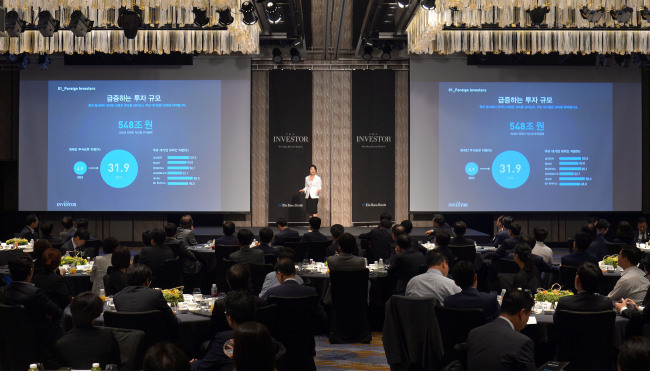 Korean media and lifestyle company Herald Corp. unveiled The Investor at a launching event held at Four Seasons Hotel Seoul. More than 130 senior officials from major Korean companies and banks, including Samsung Group, Hyundai Motor Group, SK Group, LG Corp. and POSCO, as well as leading foreign companies and organizations, including the American Chamber of Commerce in Korea, attended the event to witness the beginning of The Investor’s worldwide influence. The Investor produces more than 100 articles daily, written by a team of reporters from both The Korea Herald and its sister paper Herald Business. Real-time disclosure information will be released in English for the first time. The main focus of The Investor will be corporate governance issues. “South Korean companies has a lot of catching up to do in terms of corporate governance and we plan to shed as much light as we can on those issues,” said Kim Hwa-kyun, publisher of The Investor. The service also offers extensive coverage on the stock market, mergers and acquisitions, initial public offerings, as well as the trends and outlooks of budding tech companies and start-ups. By the end of 2017, The Investor will increase its article count to 300 after recruiting more staff writers and introducing a story-writing program. By 2018, the number is expected to further rise to 400. Kim said the idea for The Investor came about due to the growing presence of foreign investors in Korea. There are over 1,900 companies listed on the main bourse KOSPI and the tech-heavy Kosdaq markets, however, their English coverage is only up to around 100 stories a day, according to The Investor’s figures. One of The Investor’s key features is its list of 100 richest people in Korea, which includes their personal information, net worth and real estate data. The list will be expanded to the 300 richest people by 2017. Ultimately, The Investor aims to become a market changer and driver, Kim said.